Chuck Hawthorne was sitting in a Chicago airport next to his guitar case. He had been visiting friends for the weekend and was waiting on a flight back to Austin, where he had recently relocated following his retirement from the US Marine Corps. Another gentleman toting a guitar took the seat next to him and struck up a conversation. That man was Juno Award winning artist Ray Bonneville. The road that led Chuck to that chance airport encounter started on a cattle ranch in Amarillo and spanned the globe over 21 years of military service. Chuck developed his voice as a songwriter riding the Texas plains with his cowboy heroes Clifton Lowe and Alvin Hamrick, sailing the Adriatic sea and picking guitar aboard the USS Iwo Jima, writing Post 2 Gate in the basement of a Baghdad palace, and while experiencing the stories of the people he came to know in his hometown, his numerous deployments, and points in between. The 11 songs on Chuck’s debut album, Silver Line, were produced by Ray Bonneville at Shine Studios in Austin, Texas, and feature a roster of stellar guest musicians including Eliza Gilkyson and Gurf Morlix. The record recently caught the attention of Michael Martin Murphey, who heard Chuck play at the National Cowboy Poetry Gathering in Elko, Nevada. 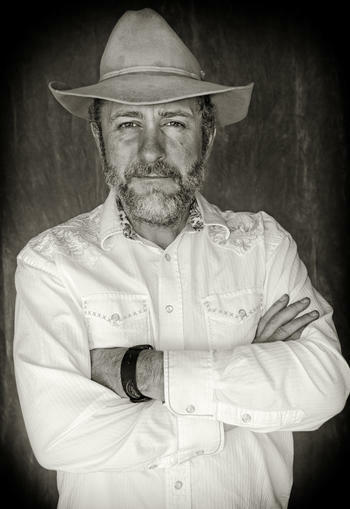 Murph has since invited Chuck to play shows with him at the Saxon Pub in Austin and the Franklin Theatre in Nashville, and along with Bonneville, he has become a musical mentor to Chuck. Chuck Hawthorne is currently touring the country in support of Silver Line, which promises to put him firmly on the Americana map alongside the great songsmiths that now admire his work.